Marilyn Manson performed in Nashville on Monday night (October 22), and among the superfans hanging around backstage were Korn members Brian "Head" Welch and James "Munky" Shaffer — oh, and Ed Sheeran. According to Welch, the G-rated ginger crooner walked past him in the backstage area of Marathon Music Works and revealed that he was a bit of a Korn fan. Sheeran even told Welch that he'd just listened to "Freak on a Leash" earlier that day. Both musicians seemed to appreciate the incongruous chance encounter, capturing the moment with a hilarious selfie. 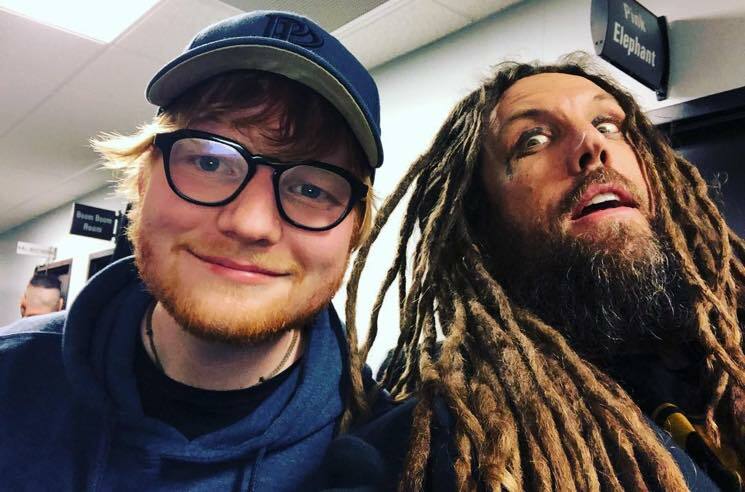 Sheeran has an impressive back catalogue of collaborations with the likes of Taylor Swift, Beyoncé and Eminem, but we're hoping he joined Korn in their Nashville studio after the Manson show to record the nü metal crossover ballad the world deserves. In related news, if you're as big a Manson fan as Sheeran and Korn, be sure to pick up one of his a-little-too-personalized dildos.